Elin Hilderbrand is the author of "The Island," "Summer People" and "The Blue Bistro," among others. She grew up in Collegeville, Pennsylvania, and is a graduate of Johns Hopkins University and the University of Iowa Writers' Workshop, where she was a teaching/writing fellow. Her short fiction has appeared in "Seventeen," "The Massachusetts Review," and "The Colorado Review." She lives with her husband, Chip Cunningham, and their two sons in Nantucket, Massachusetts. For 20 years, Kayla, Antoinette, and Val have performed their own special summer ritual. Once a year, the old friends put aside their daily, separate lives to drink champagne, swap stories, and swim naked under the Nantucket stars. This time though, one of them swims out from the shore and doesn't return. After the surviving friends emerge from their grief, they realize that the repercussions of their loss go far beyond their little circle, and they begin to uncover layers of secrets, and their connections to each other, that were never revealed on the beach. What has made their friendship strong now has the power to destroy their marriages, families-and even themselves. "Things get more twisted at every turn with enough lies and betrayals to fuel a whole season of soap operas...readers will be hooked." 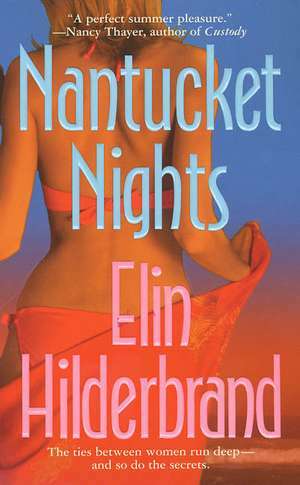 --"Publishers Weekly""What a perfect summer pleasure Elin Hilderbrand provides in Nantucket Nights, mixing the complexities of family life and friendship with suspense, romance, and moonlit Nantucket nights." --Nancy Thayer, author of "Custody""Dips deep into Peyton Place country." --"Kirkus Reviews""Ms. Hilderbrand paints a picture of idyllic Nantucket life that slowly starts to unravel as the ugly underbelly is revealed. Hidden secrets, a mysterious disappearance, and the pain of betrayal form the basis for this haunting read. "-"-Romantic Times""The novel is fast paced and suspenseful enough to keep readers interested. A likely candidate for summer-vacation reading." --"Booklist"